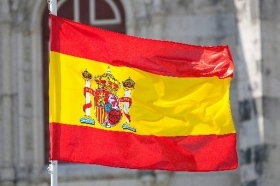 MADRID (Reuters) -- Spanish new-car sales rose 3.2 percent last month, down from a 41 percent rise in March, manufacturers' association Anfac said today as the latest phase of a government subsidy scheme ended at the beginning of April. A Spanish government-backed subsidy scheme to boost new vehicle sales has helped spur purchases over the last two years. The government is expected to extend the scheme one more time through an injection of around 200 million euros ($222.62 million). Anfac said 82,715 vehicles were sold in April, while 349,857 cars were sold in the first four months of the year, up 24 percent from the same period a year earlier. The April result marked 20 straight months of growth in the market.